If you had asked me when I was a kid what $5 could buy, I'm sure I would have had long list of answers of what that amount of riches could have bought me. These days? $5? Hmm. Accessories for a toy, possibly? As in, not the actual Barbie doll, but a new pair of shoes for her. Or maybe a sandwich, depending on your choice of location. Not much else comes to mind, and certainly not a full, filling meal out in a restaurant. But, wait! Cici's Pizza is changing all that this month! That's right! 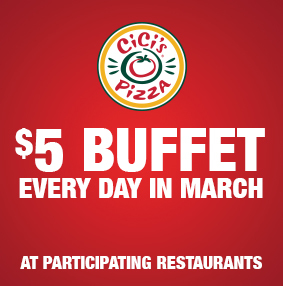 Throughout the entire month of March, CiCi's Pizza is offering its endless buffet (not including drink and at participating locations) for just $5! For that kind of deal, you can feed a family of four for $20! Dough that has been handmade and hand stretched every day since 1985. Doesn't get fresher than that! An endless selection of nearly 30 different pizzas from the classics to their delicious, crispy thin crust Italianos, to dessert pizzas and their handmade cinnamon rolls, and more. Three words: Garlic Parmesan Knots. Special requests all day long. You think it up and let them know and they will bring it straight out to your table piping hot from the oven. A fun, family-friendly environment, many locations with game rooms for kids. 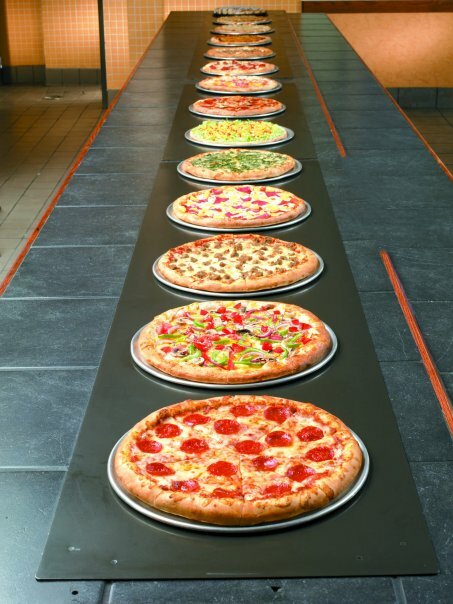 Whether you prefer pepperoni, ham and pineapple, sausage, buffalo chicken, jalapenos, onions, mushrooms, peppers, olives, bacon, spinach or just classic cheese on your pizza, you'll find them all waiting for you at CiCi's Pizza buffet. And why not also try their New Crisp Baked Wings served with your choice of Mild & Hot Buffalo, BBQ or Garlic Parmesan dipping sauce (for just a few bucks more at participating locations) before heading back up to browse the endless variety of pizzas still awaiting you? 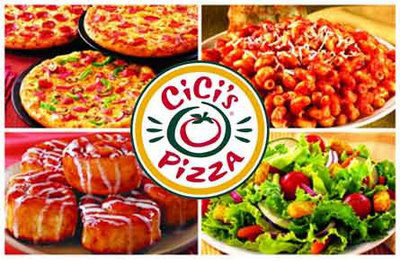 With only a few weeks of March left, be sure to take your family to CiCi's (visit CiCisPizza.com to find a location near you) to enjoy their 24-footlong buffet offering craveable pizzas, a bottomless salad bar, pasta and mouth-watering desserts at the reduced price of only $5. Yum! One lucky person will win two CiCi's Pizza Free Buffet gift cards! A big thank you to CiCi's Pizza for providing gift cards for me as well as for one lucky giveaway winner. The opinions shared are my own and honest and if you really need to see more, click here to see how I roll. I have not, but I hear the dessert is delish! Yes I have! Man and cheese pizza! I have been, but it has been many years age and I remember really like the dessert pizza. I've been there a couple times and really like it. I usually like the pepperoni or sausage pizza. I have been to CiCi's Pizza before. I like the pepperoni or pepperoni & mushroom pizza. I haven't been in a few years, but I remember liking the cheesy bread the most! Salad is good too! I love the Spinach Alfredo pizza. We like to order a Pepperoni and Black Olives pizza when we go! We have never gone but I haer they have a lot to pick from. I have never been but my daughter who lives in a bigger town loves to go. I love pizza and would love to try it on my next visit to my daughter's. I actually have never been to CiCis but would love to because I hear the pizza is great! I have never been there, but we love pizza!!! Yes I have been to cici's. We used to go all the time when I was in college. I have never been, but I noticed one across from our local mall that I've been meaning to check out. I haven't been there in awhile but my favorite item is the salad bar ... hopefully they still have it! :-) And after a healthy salad, I head straight for the cinnamon rolls. LOL! I haven't been there but my niece raved about it after her visit. I've been to CiCi's Pizza before. I like the pepperoni pizza. We've only been there once, but I think my favorite was probably a bbq chicken pizza. I havevisited CiCi's Pizza and my favorite menu item there is the Spinach pizza. My daughter and I just went 2 weeks ago. My favorite used to be the BLT salad they had at the store where we used to live. They don't have it here, but they do make just about any pizza you want. If you ask, they do custom ones. Yes, we love CiCi's! My Grands favorite Pizza if the Spinich Pizza...we also like the cinnamon roll desserts. Yes I have been to CiCi's and my favorite item is the sausage pizza. Yes, we go to cici's often. We love the variety, but my favorite item is the cinnamon rolls! Have not been there. Want to try the different pizzas. Yes, we have ate at Cici's before. I love their cheesy garlic bread. I love CiCi's! The pizza is really good. I usually order a Hawaiian Pizza. The ham and pineapple are a great sweet and salty flavor combination. If I am not feeling up to Pizza I can always have Salad and Spaghetti meal. I'm a pretty basic pizza person, my favorite kinds of pizza are plain cheese and then mushrooms. Although, at CiCi's I really like the cinnamon rolls after the pizza or during sometimes! We've been to CiCi's Pizza before. My favorite item there is the garlic cheese bread. I have not, would like to try the Hawaiian if they have it. I have been there and love the Ole pizza. I love their plain cheese pizza! Simple. Yes, we have eaten at Cici's pizza many times. I like their Buffalo Chicken pizza. Yes, I've been to Cici's many times. When all the kids lived in Joplin, we used to meet there for an inexpensive meal where everyone would get full and we could spend time together. It got destroyed in the tornado...I keep wondering if they've rebuilt it. Their Chicken Alfredo pizza is good. I have not been yet, but my boyfriend lives down the street from one. He loves pizza, so we need to try it soon! I have been to CiCi's several times, and I've always enjoyed their BBQ chicken pizza and their dessert pizzas. I visit and love the mac and cheese pizza. I've gone once. I like all the different variety of pizza. We just went to CiCi's last week for the first time & it was fantastic. We enjoyed all the pizzas - my son & grandson liked the BBQ Pulled Pork pizza the best. I've never had the chance but the buffet sounds great! My favorite thing to eat at CiCis is Mac and cheese pizza. My fvorite is the spinach pizza. I've been to Cici's! I love the dessert pizza on the buffet! I have never been to a Ci Cis but it always looks so good on the commercial. They just built one in my city so I am excited to go. I have visited CiCi's Pizza before and my favorite is the dessert pizzas. I love their dessert pizzas! Bread sticks are great too. As well as salads! Yes,and I love their pizzas! yes, i love their macaroni pizza! I love their hog heaven pizza. I LOVE Cici's Dessert pizza. I'm not quite sure what it's made out of, but it's delicious!! There is a Cici's around the corner from my house - they have a great Taco Pizza. I have not been to Cici's yet but have wanted to go since I saw their commercial on tv. I've never been, but we saw one in the town over the other day. Would love to try it out. I like that there's something for everyone. Yes ive been there, i LOVE their white pizza! I've never been but the Garlic Parmesan Knots sound like reason enough to visit! I haven't been there, but my hubs has. I like the idea of there being something for everyone, so my kids can be happy too! I have been to Cici's, and I really enjoyed their mac and cheese pizza! I like the Mac & Cheese pizza. Yes, I like the regular cheese pizza but I also love their dessert pizzas! I have not visited there, but would like to try their pizzas. I do enjoy CiCi's, especially their little cinnamon bun desserts. Those are SO good! I also like how their mac & cheese pizza. I love the apple dessert pizza. I have never been. This used to be my husband's favorite place to eat as a teenager so I really want to try it! I've never been and my daughter is always asking to go! I love the veggie pizza. I love their macaroni and cheese pizza! I love Cici's! I always order a special pizza: anchovies, mushrooms & onions, sometimes jalapenos. I have never been to a Cicis but would love to go to one. would love to go, never been! the commercials look great with all the varieties. I love it! The different pizza's are great and I like the salad bar too! I like Cece's Pizza. There pizzas are yummy and I like their desserts. I haven't been there in so long, because there was one that closed down close to where i live. The pepperoni pizza was my favorite. I like the apple pie dessert pie. My kids have all been to Cicis but I haven't-- would like to share it with them. I have, but not in a very long time. I think my favorite part was the gooey cinnamon rolls! Yes, I love the fact that you are able to try all kinds of pizzas there on the buffet; discovered new tastes! I LOVE This place! I have to roll myself out of there every time I go! I love Cicis. The BBQ pizza is awesome. Yes and I love the cheesy bread and the alfredo cheese pizza. I love cici's! More for the brownies than the pizza. Lol. 4 words, MACARONI AND CHEESE PIZZA!!! Ive been there before. I love their pepperoni pizza. 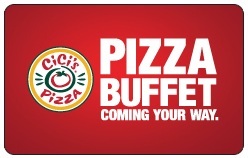 I have never been to CiCis but I look forward to trying it!!! Been there and love the cheesy flatbread pizza. I have been to CiCi's many times and my favorite item is the pasta with alfredo sauce on it! I've been a bunch and I love the chicken pizza. It has been a while, but yes, I've been to Cici's and really enjoyed it. I loved the dessert pizzas! Amazing! Yeap Love CiCI's especially the thin Pepperroni, Yummy and teh chocolate chip pizza is great...My granddaughters also love it.. I have only been to Cici's one time long ago. I need to go again so I say what my favorite item is. I've been, but it's been a while. Oh yeah, been there lots! Love the buffalo Chicken Pizza! Yumm! I have visited, and I love their desserts! There's one on the far side of town where we live, and we sometimes go when we're running errands. My favourite thing to eat there is the Cheeseburger Pizza (the pickles make the dish) followed closely by the cinnamon buns! I've never been but I'd like to try a little of everything! I was there years ago and enjoyed several of their pizzas. We haven't been in a long time, but I love the price and the cinnamon rolls are so good! I've never been before, but my husband was taken there by his father, and he said it's delicious, and that he would love to go back! i have never been but haven't met a pizza I didn't like, either. I love the Spinach Alfredo Pizza! Yes I have. I love their Pepperoni Pizza! I like the dessert pizzas. Cheese pizza sounds good.. never been there before. We havent goneyet but we love pizza so we probably will! my favorite is their supreme pizza! I go there often. I love the Alfredo Pizza that they have sometimes. When I am at the beach I eat at CiCi's all the time and I love the pineapple pizza. we like their pepperoni pizza and their salad bar! ive been there once and i love the cheesy flatbread pizza. I've been there once and liked their brownies. No, I have never been to a Cici's before, but I've heard very good feedback about it. Yes, I have been to CiCi's before and I love their cinnamon rolls. I love CICIs. There BBQ pizza is my favorite. I have never been but I love love love spinach, mushroom, and bacon on pizza... So delicious! I love their brownies the best! I haven't ben there in quite a few years but I loved the Chicken BBQ pizza. Yum! The kids love it when we take them there. Love the barbecue chicken pizza and the killer cinnamon rolls.